I know you all remember the scene in Raiders of the Lost Ark when Indiana Jones guns down that big Arab swordsman in the middle of an Egyptian market. The scene was originally going to be an awesome fight sequence between a whip and sword. The swordsman trained for months, and they rehearsed the sequence several times on set. When the day came to actually shoot it Harrison Ford wasn't feeling very well, because he ate some bad food the night before. 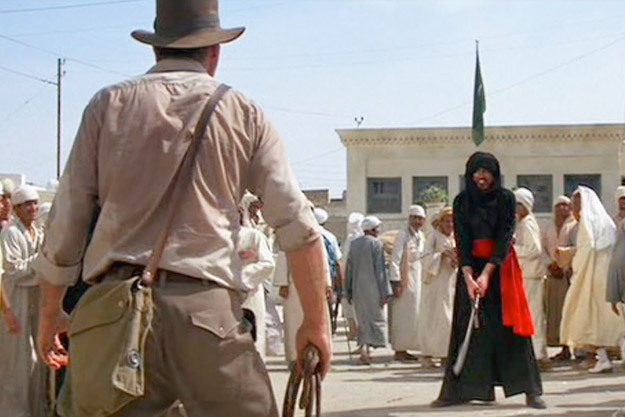 Ford ended up suggesting he just shoot the swordsman instead, and Steven Spielberg ran with it. In the end, it turned out being a great scene that many of us found funny. The guy they hired to play the swordsman was a little upset, and on the first take he tried extending his screentime by stumbling around to drag out his death scene. On the second take, Ford fired the gun before Spielberg even said action! The swordsman was so stunned that he just fell back, and that's the take they ended up using in the film. Thanks to the wonderful internet, and the upcoming released of Indiana Jones: The Complete Adventures Blu-Ray set, we have the rehearsal footage that was shot, showing us what this whip vs. sword fight scene could have been. Watch it and let us know which one you prefer! Thanks to EW for the footage!